I want the best wack Title so users can find it easily. What do I do? First, keep in mind: Keywords are important. They're the basis of Search, so get familiar with 'em. We're including a quick tutorial here to lead you. It may look lengthy but it's quick, we promise. We're creating a wack and we've gotta come up with a good Title so that people find it. In this instance, we've got a laptop that's crashing. And it's defective. Our goal is for as many members as possible to find our wack, and find it easily. If we do it right and create a great wack Title, it'll naturally come to the top of Search results users are gettin'. 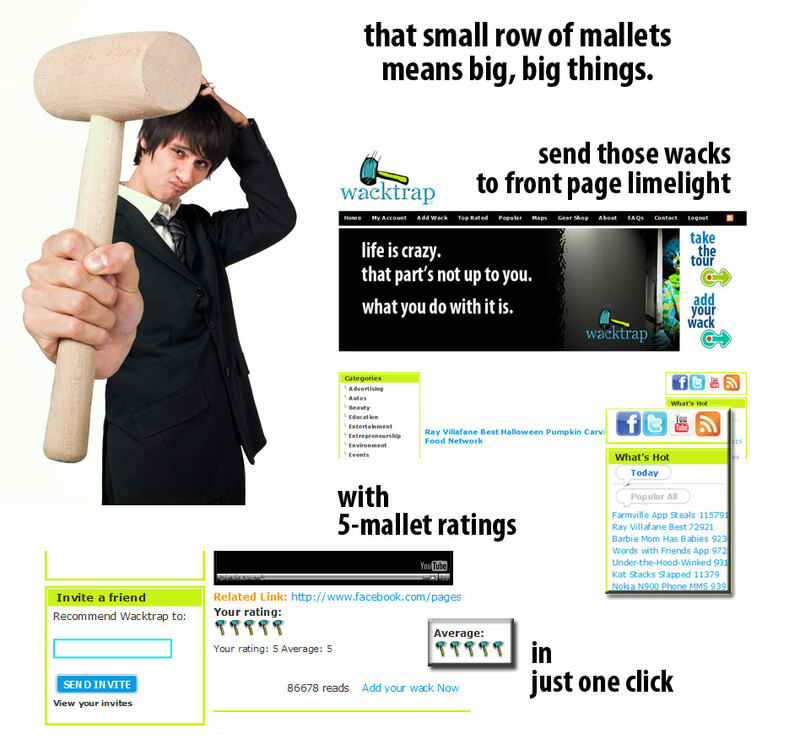 When your wack's at the top of results, members Rate your wack and even get that wack promoted for feature on the Wacktrap homepage. We're using a product for this example, since products require the most info or Keywords you'll ever need to enter. Slim it down, to apply this to any company, service, industry, company, issue, or topic, to use for any wack you add. 10) We’re almost done-we promise. What’s occurring? In this case, the laptop's crashing-constantly. So we need to describe what it’s doing-and describe it in active form: it's ‘crash-ing’, and that ‘ing’ is important. 12) Location Name. Any time you add a wack, Wacktrap's givin' you a special spot to specifically list Location name and physical address info of a related company or business. Including this info allows people to find wacks related to that same company, or even wacks related to the exact physical address location. If your wack involves store location, a chain or franchise in any industry, including an airline and airport, you're also gonna want to plug that info into your wack Title as city and state. Just leave the commas aside: i.e., New York NY. Click here to Add a wack now and get started! Can I edit my wack? Just as they occur in life, experiences are permanent, and so are those you upload to Wacktrap. Edits or alterations provide opportunity for things to go awry. Broken or dead links, cached info that's just not there, or wacks you simply can't find: you won't be happy if things aren't showin' up where they're supposed to, and we wouldn't want that happenin'. What are the 4 Commandments for every wack Title? Keep your wack a live wire in Wacktrap Search Results! You want your wack to rise to the top, where it belongs-so users can read it, Rate your wack and Comment. Here's some tips for how to create the best wack Titles. What is the only purpose of a wack Title? Your wack Title has one purpose: to enable people, all over the world, to find your wack. The one way to achieve that purpose: get all the important stuff, and only the important stuff into your wack Title. What the heck does Keyword refer to at Wacktrap? Why avoid short words like a, an, the, it, to in my wack Title? Avoid words like ‘I’, ‘and,’ ‘an’, ‘a’, ‘as,’ ‘the’, ‘to’, ‘or, ‘in,’ ‘it,’ ‘if,’ ‘but,’ ‘you,’ ‘etc,’ or similar two or three-letter words when creating your wack Title. Trust us, you don’t need ‘em. And, we promise, you really don’t want ‘em. Do I have to include a pic, video, url or pdf in my wack? Heck, no. You don’t have to attach anything to your wack you're not feelin' like including. Wacktrap provides optional fields, to allow our members inclusion of four different types of optional media and references. We've also provided a specialized field, for Location Name and address info for wacks related to any business.